For contemplative nuns, prayer is at the heart of every moment of every day. They experience a deep connection with the world through prayer, even though they have limited contact with people outside the monastery, or cloister. Unceasing prayer, however, does not equate to sitting in a chapel 24 hours a day! There is a balance of maintaining a certain “sacredness” throughout the day and participating in the ritual action of prayer at specific times. Prayer is a movement into the heart of God, toward divine union. Our life of prayer has communal and solitary expression, in keeping with a key precept of Carmelite life to hold silence/solitude and community in creative balance. Taking these values as equal priorities, not emphasizing one over the other, is a significant challenge, and differentiates Carmelites from many other religious orders: we are hermits in community. A typical day would include chanting the liturgy of the hours at designated times. Daily mass is celebrated together, and each sister spends an hour or more studying various spiritual readings. The remainder of the day is given to community meetings, individual chores within the monastery, and mealtime which usually includes some recreation time together. Compline, also called night prayer, is usually prayed in solitude when the day is complete. To those for whom the contemplative life is the right vocational fit, it is a beautiful life and one that brings great joy! Contemplative nuns hail from many different backgrounds and ways of life, including various careers and educational degrees. 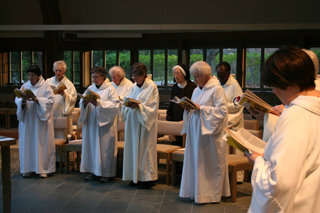 Most contemplative nuns do not see their choice to enter the monastery as “giving up” their former way of life, but rather they recognize how God brings all the pieces of their life together. God uses all of who we are in order to form us as individuals and shape the communities to which we belong. Furthermore, contemplative nuns trust that their prayer and way of life has an impact on the world. They are not removed from the joys and hopes, pain and sorrow of our world. Rather, the needs of the world are brought to light in prayer, and those called to the contemplative life trust that their faithfulness to prayer will have an impact on those who are suffering. In a world filled with strife, the contemplative sisters’ commitment to prayer and dedication to community serves as a witness to the collective consciousness of our world. They live in hope that we can all move toward greater fidelity, trust, mutuality, and love. Their presence shapes those around them, and sends greater healing, joy, and peace into the currents of the earth. Their lives have a positive impact that cannot be measured. It is not always quantifiable. It is important to note that one cannot “hide” in the silence of the monastery. Although dedicated to prayer, one must be present to their sisters when gathered in chapel, at meals and at team meetings. To be mindful of one another requires self-giving. There are times when a life filled with solitude brings great comfort. At other times it can become hard. In the difficult times one is called upon to develop a forgiving nature and to be open to God’s call to be transformed. The beauty of this life comes from conquering one’s interior struggles and responding in prayer to the needs of those around you.